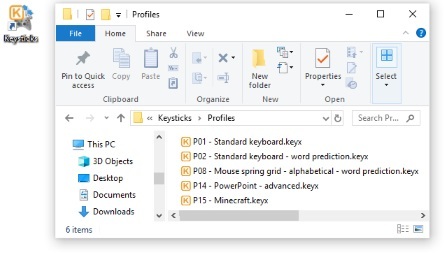 To start controlling your PC using Keysticks, you need to load a profile. A profile is a file which defines what you want your controller(s) to do. Keysticks runs one profile at a time, but profiles can be as simple or as complex as you wish. Profiles can contain multiple sets of controls that you switch between using your controller or that are activated automatically in a particular program or game. Profiles also allow upto 4 players with upto 4 controllers, and you can customise the mappings to the controllers' physical controls. If you know which profile you want to use, you can simply double-click it. A number of sample profiles are provided in the "Keysticks/Profiles" subfolder within your documents. There's also an "Open profiles folder..." option on the Keysticks program menu for quickly opening this folder. Alternatively, you can click the "Choose a profile..." button in the controller window (or from the Keysticks program menu) to open the Profile Browser. Here you can browse your profiles and preview what the controls do. It's a good idea always to familiarise yourself with a profile's controls before using them. When you click "Load", the selected profile will be loaded and the controls in it will be applied. You can also double-click a profile in the My Profiles list to load it. The Profile Browser also has a "Download Area" tab which allows you to download profiles that other users have shared. We'll come back to that in the Downloading profiles topic.